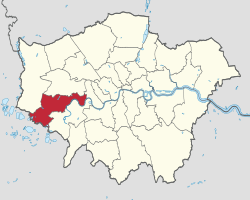 The London Borough of Hounslow ( pronunciation ) is a London borough in west London, England, forming part of Outer London. The borough stretches from near Central London in the east to the border with Surrey in the west, covering Chiswick, Brentford, Isleworth and Feltham in addition to Hounslow itself; it borders the boroughs of Richmond upon Thames, Hammersmith and Fulham, Ealing and Hillingdon, plus the Surrey borough of Spelthorne. Landmarks include Osterley Park, Gunnersbury Park, Syon House, the London Museum of Water & Steam and Chiswick House. 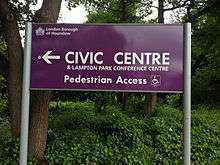 The local authority is Hounslow London Borough Council. 53.3% of the borough's population is White, 34.4% is Asian, and 11.6% is Black. There is a major split between ethnic diverse areas and those that are not: the eastern part of the borough (e.g. Chiswick, Turnham Green) and the western part (e.g. Bedfont, Feltham) have White British majorities and have a low foreign-ethnic population. Meanwhile, the central wards, consisting of the areas of Hounslow, Hounslow West, Hounslow Heath, Cranford and Heston, have a very high ethnic diversity with a low White British population. Unemployment is highest in the Heston West, Brentford and Hounslow Central wards. Population density is highest in Hounslow West and Hounslow Central wards, and lowest in Bedfont, Grove, Heston West and Hanworth Park wards. Elections across the London Boroughs are currently held every four years. 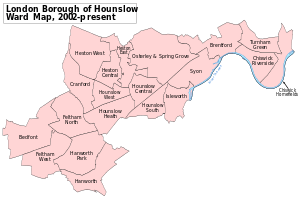 Since the Hounslow borough was formed it has been controlled by the Labour Party on all but two elections: in 1968 the Conservatives formed a majority until they lost control to Labour in 1971. The 2006 local elections produced a no overall control result. Although Labour was the largest party on the Council, the Conservatives formed a coalition with the six Councillors from the independent Isleworth Community Group (ICG) which administered the area until the 2010 local elections when Labour regained control. Reflecting how votes were cast in the national elections, in separate polls held the same day, for the 2010-2014 period, the Conservatives and Labour won fifteen seats each from the Brentford and Isleworth (UK Parliament constituency). Overall, control was held by the Council's Labour administration as 20 Labour Party Councillors and 10 Conservative Party Councillors were elected for wards in the Feltham and Heston half of the borough. Between 1998 and 2006 Independents were elected to the London Borough of Hounslow from the area. The first Independent Community Group (ICG) Councillor was elected in 1998 as Isleworth Community Group in Isleworth. In 2002 three ICG Councillors were elected in Isleworth. In 2006 six ICG Councillors were elected (Syon and Isleworth wards), and former Labour Leader of the Council John Connelly was re-elected as an Independent in Hounslow Heath ward. All seven of the Independents were defeated in the local elections held on 6 May 2010 by, in their respective wards, Labour Party candidates. Since then one Conservative councillor has become an Independent and four Conservative Councillors have defected to UKIP. The town of Hounslow, which has existed since the 13th Century, is located at the centre of the Borough of Hounslow. 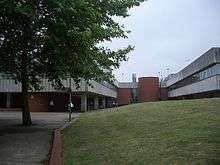 The name Hounslow means 'Hund's mound'; the personal name Hund is followed by the Old English hlaew meaning mound or barrow. (The mound may have been his burial place.) It was recorded in the Domesday Book as Honeslaw. 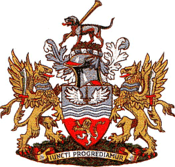 The borough was formed in 1965, under the London Government Act 1963, by the merger of the area of the former Brentford and Chiswick Urban District, Feltham Urban District and the Heston and Isleworth Urban District (which held borough status as did Brentford and Chiswick) of Middlesex. Hounslow abuts the perimeter of London Heathrow Airport in the London Borough of Hillingdon. Plans for the expansion of Heathrow Airport are vigorously opposed by Hounslow if such plans increase or widen noise and pollution, weighed against arguments of greater employment and spending. The borough has forty-seven bus routes (27, 65, 81, 90, 94, 105, 110, 111, 116, 117, 120, 190, 195, 203, 222, 235, 237, 267, 272, 281, 285, 290, 391, 423, 440, 481, 482, 490, 635, 681, 813, 941, E2, E3, E6, E8, H20, H22, H25, H26, H28, H32, H37, H91, H98, R70, X26), some of which are 24 hours services, and two night services (N9 and N11). on the North London Line: Gunnersbury. on the Hounslow Loop Line: Chiswick, Kew Bridge, Brentford, Isleworth, Syon Lane, and Hounslow. River services between Westminster Pier and Hampton Court depart from Kew Gardens Pier just across the River Thames from Hounslow. Principal roads in Hounslow include the A4 (Great West Road), the elevated section of the M4 motorway, the A406 (North Circular) and A205 (South Circular) roads, all of which meet at Gunnersbury just west of Chiswick. The A4 runs eastwards into central London via the Hogarth Roundabout where it meets the A316 (Great Chertsey Road) which runs south-west, eventually joining the M3 motorway. Three stations lie just outside the borough's northern boundaries. Chiswick Park and Acton Town (both in the London Borough of Ealing) and Hatton Cross tube station (in the London Borough of Hillingdon) serve the borough's residents. The borough is home to the headquarters of GlaxoSmithKline and Sky plc, both based in Brentford's 'Golden Mile'. Fuller's Griffin Brewery is also in the borough, in Chiswick. Aston Martin were based in Feltham for several years before moving to Newport Pagnell, Buckinghamshire. DHL Air UK has its head office in Hounslow. Air France-KLM's head office for United Kingdom and Ireland operations, which includes facilities for Air France and KLM, is located in Plesman House in Hatton Cross in the borough. [n 4] The Plesman House, outside of Terminal 4 of London Heathrow Airport, has the UK commercial team, sales team, and support team. 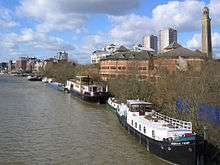 Sega Europe has its head office in Brentford. Menzies Aviation has its head office by the airport in Feltham. JCDecaux UK has its head office in Brentford. Before winding-up British Mediterranean Airways was headquartered at Hetherington House near London Heathrow Airport. CB Hounslow United F.C. who play at the Osterley Sports Ground. Hanworth Villa F.C. who play at Rectory Meadow. Bedfont & Feltham F.C. who currently play at the Orchard in East Bedfont. Bedfont Sports F.C. who play at the Bedfont Sports Recreation Ground. Ashford Town F.C. (Middlesex) who play at The Robert Parker Stadium. The borough is also home to Staines Rugby Football Club who play at the "Reeves" in Hanworth. Hounslow has a sister district agreement with Leningradsky District in Krasnodar Krai, Russia. Ian Gillan, vocalist for Deep Purple, and formerly of Black Sabbath and Gillan, is a native of Hounslow. Alistair Overeem a UFC Champion is also born here. ↑ The facility's inauguration was on 6 July 2006. Air France moved the office from Hammersmith, where it had been located for 15 years, to Hatton. ↑ "2011 Census: QS701EW Method of travel to work, local authorities in England and Wales". Office for National Statistics. Retrieved 23 November 2013. Percentages are of all residents aged 16-74 including those not in employment. Respondents could only pick one mode, specified as the journey’s longest part by distance. ↑ "Online Shipping." DHL Air UK. Retrieved on 23 April 2014. "DHL International (UK) Limited Registered Office: Orbital Park, 178-188 Great South West Road, Hounslow, Middlesex TW4 6JS"
↑ "AIR FRANCE and KLM celebrate official inauguration of new office in London." Air France. 6 July 2006. Retrieved on 13 February 2010. ↑ "Career Opportunities." Air France UK and Ireland. Retrieved on 13 February 2010. ↑ "Corporate." SEGA. Retrieved on 31 January 2011. "SEGA Europe Ltd. 27 Great West Road Brentford Middlesex TW8 9BW United Kingdom ." ↑ "Contact Us." Menzies Aviation. Retrieved on 18 February 2011. "Menzies Aviation plc, 4 New Square, Bedfont Lakes, Feltham, Middlesex, TW14 8HA, United Kingdom." ↑ "Head Office Location." Menzie's Aviation. Retrieved on 18 February 2011. ↑ "Contact Us." JCDecaux UK. Retrieved on 28 September 2011. "JCDecaux UK - Head Office 991 Great West Road Brentford, Middlesex"
↑ "Contact." British Mediterranean Airways. 26 June 2006. Retrieved on 20 May 2009. ↑ "Maps & GIS." London Borough of Hounslow. Retrieved on 20 May 2009. ↑ Cumber, Robert (17 December 2010). "Council to revive links with Palestinian town". Hounslow, Heston & Whitton Chronicle. Retrieved 16 August 2012.